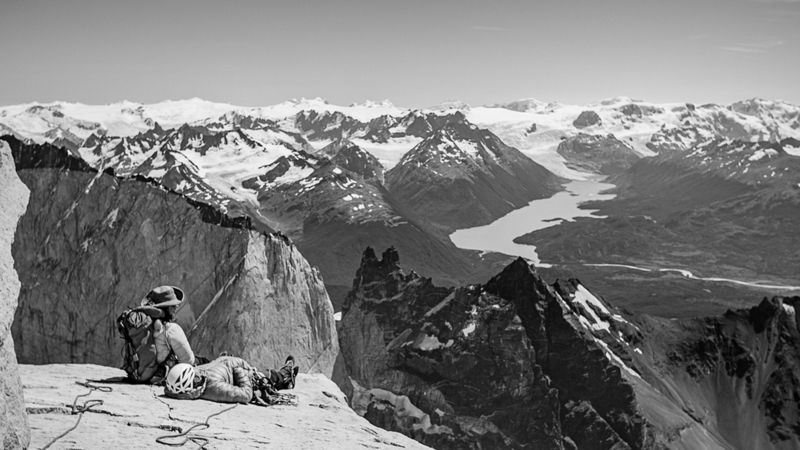 On the 6th February Ines Papert and Mayan Smith-Gobat accompanied by photographer Thomas Senf summited Torres Central, in Torres del Paine National Park, via the east face. Succeeding in making the fifth known ascent of Riders in the Storm, 25 years after the first ascent of this historic route. This stunning line on the sheer 1300m east face of Torres Central was first climbed by Wolfgang Guellich, Kurt Albert, Bern Arnold, Peter Dittrich and Norbert Baetz In January 1991 in fifteen days of climbing over a six week period. The line went at 7c, A3. 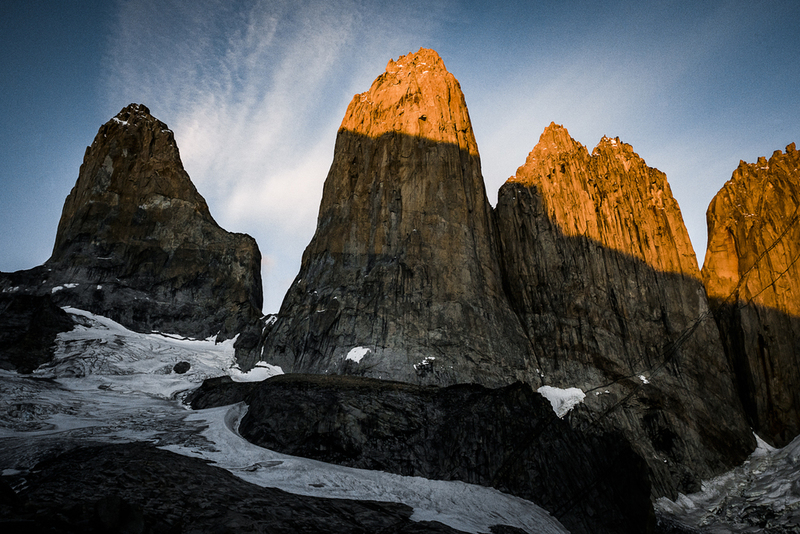 Since then there have been several attempts to free climb the entire route but due to iced up cracks and the difficult weather conditions in Patagonia, two pitches of steep crack climbing near the top of the route prevented freeing them. 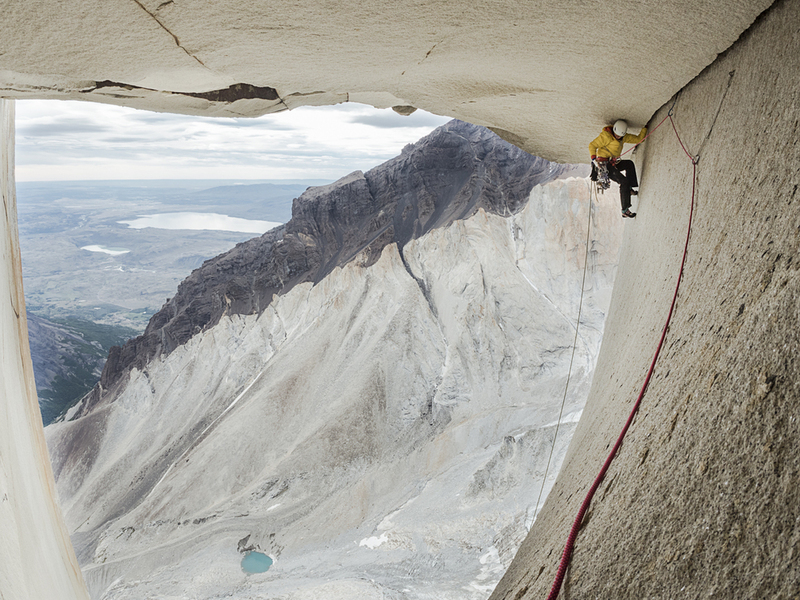 There was also one pitch near the middle of the face where a pendulum and bat hooking is necessary to get past an entirely blank section of rock. Ines and Mayan's goal was also to free climb the entire route. The trip began with incredibly stable weather and in their first week on the wall the pair succeeded in finding a very difficult five pitch variation to avoid the lower aid section. However, to make the most of the stable weather, they chose to focus on freeing the upper section and making it to the summit, before investing time into climbing these difficult pitches. On the last day of the weather window, after 3 weeks on the wall, Mayan with fingers bleeding from countless places, succeeded to free climb pitch 29 and 30 in the early morning sunshine, before the upper crack became a waterfall from ice melting above. Then Ines, Thomas and her continued on to the summit of Torres central, reaching the top at 12.48 on the 6th February on a stunning and surprisingly wind still day. However, the team’s success was quickly dampened by rock fall hitting their portaledges that night, tearing Ines and Mayan’s ledge open and narrowly missing them. Shaken yet still determined to finish the route, they returned to work on free climbing the lower pitches. Discovering that especially in warm weather this face is quite exposed to both ice and rockfall for the top of the peak - which is comprised of loose blocks held together by ice. 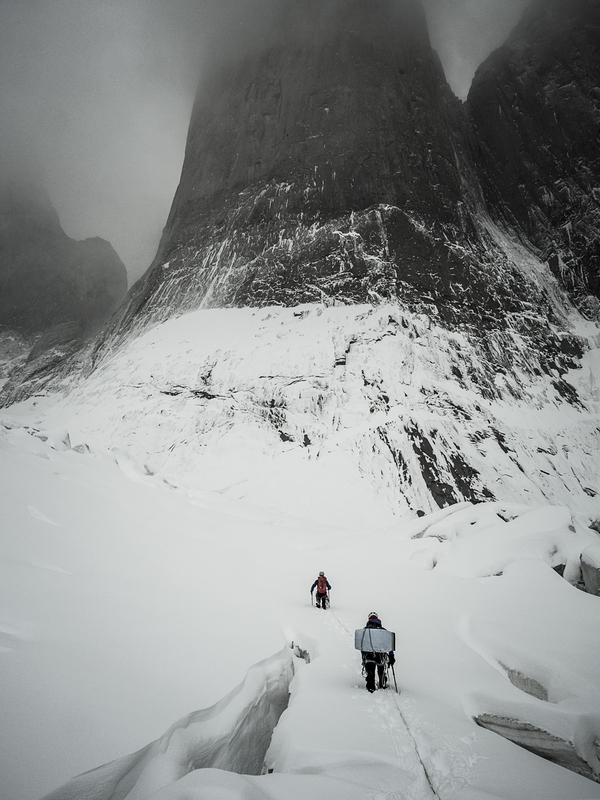 The climbing on Riders on the storm is demanding varied, from delicate face climbing with poor protection to off widths entire filled with ice. Ines climbed one pitch using an ice shoe with crampon on one foot and climbing shoe on the other and two ice axes which were also used as protection in the frozen crack - The “Papert-Technique". The team battled on, and in ever deteriorating weather managed to free all but two pitches of the original route and the most difficult two of their new variant. However, unfortunately in the last ten days of Ines and Mayans time in Patagonia they were hit by extremely bad weather (more typical for Patagonia...). With winds over 120km and snowfalls down to 500m, the entire route became plastered in snow and the team ended up having to retrieve their gear in the few days where the storm abated slightly. Getting no further chance to climb. 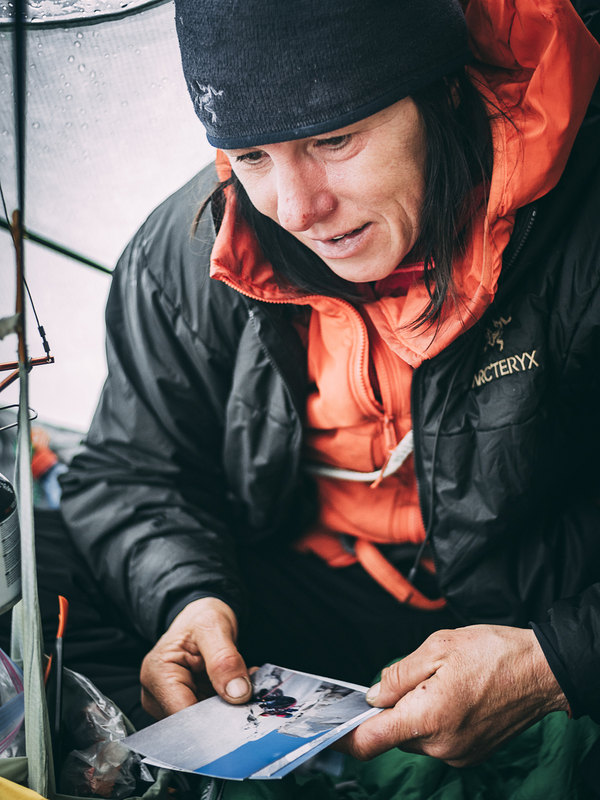 Though they didn't succeed in freeing the entire route Ines and Mayan did have an extremely successful trip, resulting in a rare repeat of Riders in the storm on the 25th anniversary of its first ascent. In addition they have found a variation to the original line which, though likely to be very difficult, they both believe will definitely go free. Due to the unpredictable risks of this face Ines has decided against returning, however Mayan is motivated to attempt the route again next summer.